I’ve seen a couple of bloggers do this over the past week (I think the trendy bloggers call it a WIMB), but when Jaina posted hers this morning, I decided to follow suit. Plus, I’ve never done this for my Project 365. 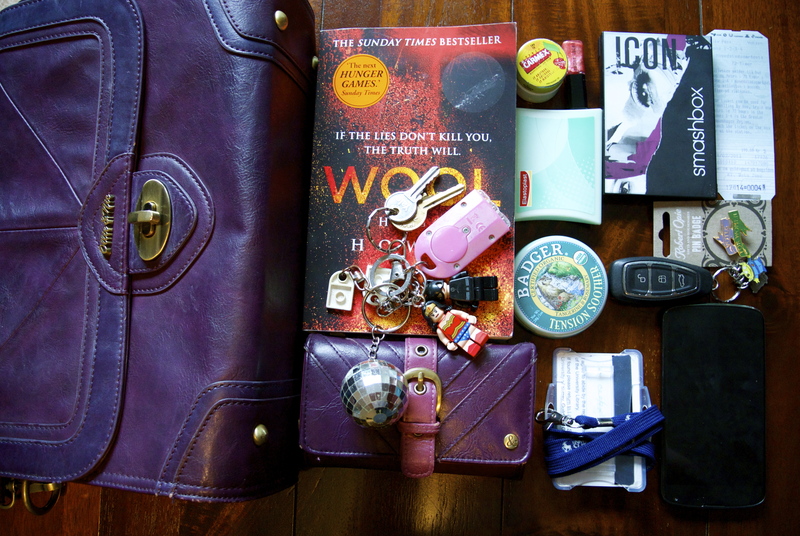 Purple Ollie and Nic purse – what can I say, I have brand loyalty. Keys and keyrings – a mirror ball (which makes it incredibly easy to find), Lego Wonder Woman, one-handed Lego Catwoman and a mini-light. Wool by Hugh Howey – I always carry a book around with me, and this is my current obsession. I’ve just ordered the second in the series as well. Such a compelling read. Mini Bobbi Brown lip gloss – I usually have a MAC lip balm/gloss, but I appear to have mislaid it, so I’m using a freebie Bobbi Brown gloss I got in a recent haul. Elastoplast SOS plasters – honestly, the most amazing plasters. I’m wearing a pair of shoes that are killing me right now, and this wonder product has saved me so much pain. Badger Balm Tension Soother – my job can get a little stressful at times, so I just rub some of this onto my hands to chill out. It’s also a really great hand moisturiser. Staff pass – couldn’t really get into my office without it. Rutger, my Google Nexus 4– couldn’t live without it. Car keyless entry fob, with aToy Story aliens keyring that I’ve had for years. Votes for Women pin badge – I got this from the British Library a couple of weeks ago, but I haven’t decided where to pin it yet. Copenhagen Metro pass (klippekort) – this has been in my bag since my last trip to Copenhagen. It’s not remotely valid, but I like to keep it. Red Nikon 1 camera and lens (not pictured, for obvious reasons). 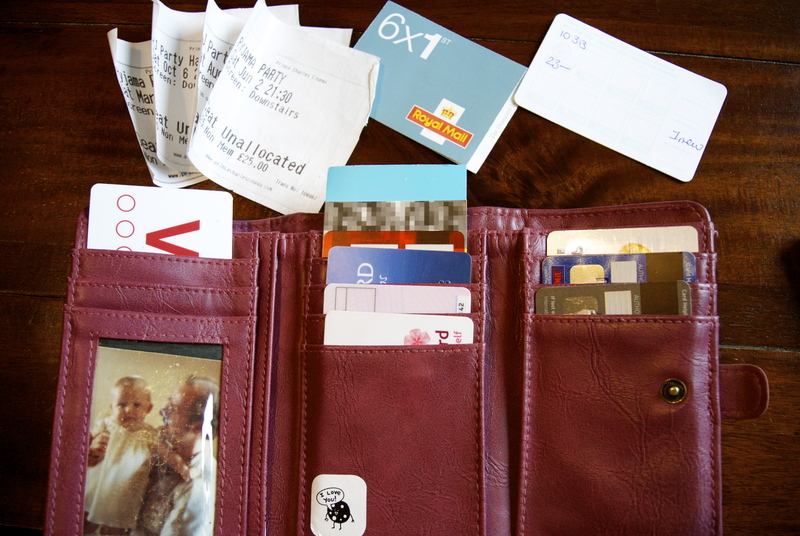 And bonus What’s in my Purse photo! 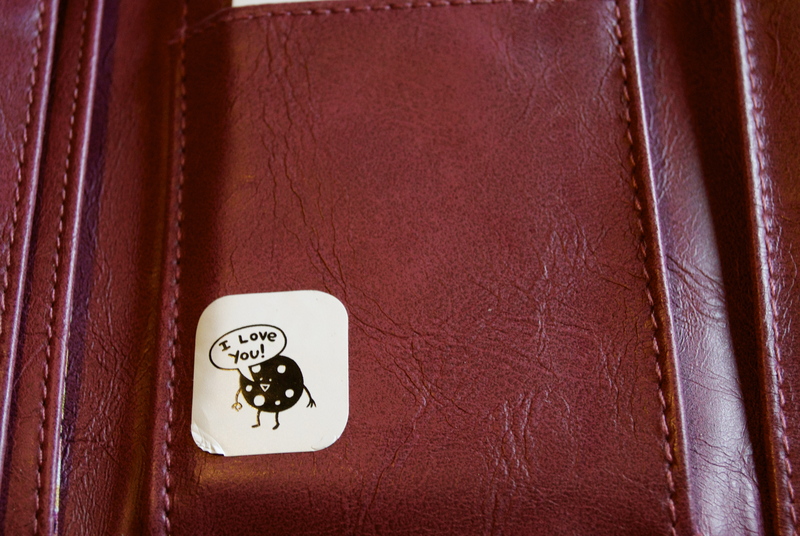 And this little guy is a sticker Husband gave me, which now transfers from purse to purse. Should have taken a photo of my bag! Never mind. I like the bonus purse photo. You can do a separate post on your bags!